That’s the definition of the word flux. But it’s also a summary of Flux, Cadence Dance Company’s winter show. 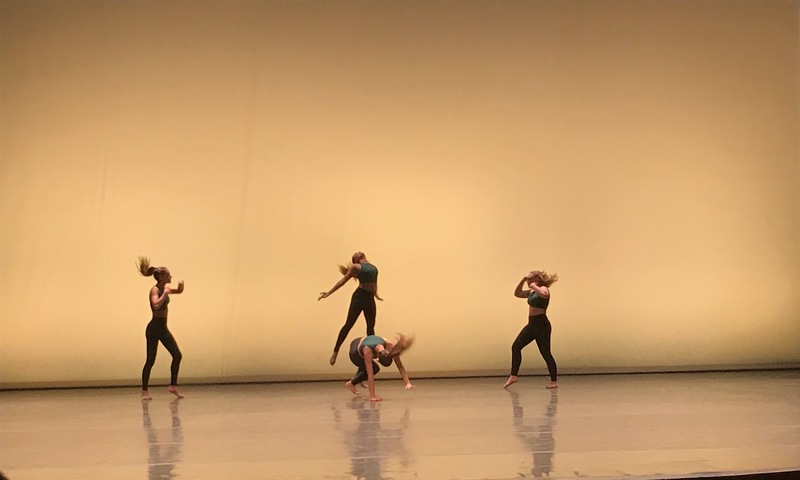 With a collection of contemporary pieces set to a soundtrack of indie music, Cadence, a self-choreographed dance company, showcased more than just movement. They told stories with every piece, stories that changed and evolved as the dances developed. Especially in their large-group numbers — which I preferred to the small-group ones — Cadence showed a willingness to take risks with their choreography. The opening number, “8 (Circle)” utilized unique formations and lifts to great effect. The small-group numbers didn’t have enough dancers to use those formations, so several of them had more standard contemporary moves. That didn’t mean it wasn’t innovative, though. My favorite of the small groups was “All Night,” which featured stools as props. Cadence was strong technically, especially when it came to their turns. There you could see the amount of rehearsal they put in; their turns were well synchronized even in complicated turn sequences. But at the same time, they didn’t overdo it on the turns. However, my favorite technical aspect of Cadence’s dances were the lifts. Many numbers — especially the large-group ones — incorporated impressive lifts that at once showed grace and strength. I was especially impressed with the finale, “Landfill.” The choreography was unique and affecting. The lifts and turns looked good. And though it was a full-company number, the end featured partner work. 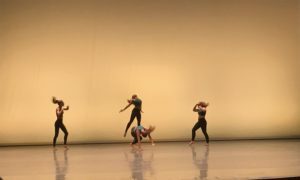 The partner choreography added to the meaning of the dance’s narrative about a toxic relationship. The two partners’ chemistry was such that it made you feel something. The number packed a punch and was the perfect ending to the show. Cadence’s penultimate piece was called “Vor Í Vaglaskógi.” It was a senior number, a concept I haven’t seen from any other student groups. I liked the concept of giving the seniors one last number together, and that added more meaning to the movement. That said, some of Cadence’s other numbers were somewhat forgettable. They weren’t bad by any means, but there was somewhat of a gap between the best numbers of the show and the others. I may have made the show a little shorter — putting more emphasis on the strongest numbers without really taking anything away. The guest numbers — from hip-hop crews FunKtion and Encore, a cappella ensemble The Friars and tap dance group RhythM Tap — complemented Cadence nicely without overshadowing the main show. All in all, Flux was an impressive concert that brought to the table things I haven’t seen from any other student dance group. Their passion for what they did shined through and created something unique and bigger than themselves. Aria Gerson is a sophomore who still doesn't know what she wants to major in. You can find her drinking way too much coffee, listening to depressing indie music, writing about sports for The Michigan Daily or spending way too much time on Twitter, where you can follow her @aria_gerson. REVIEW: Call Me by Your Name.